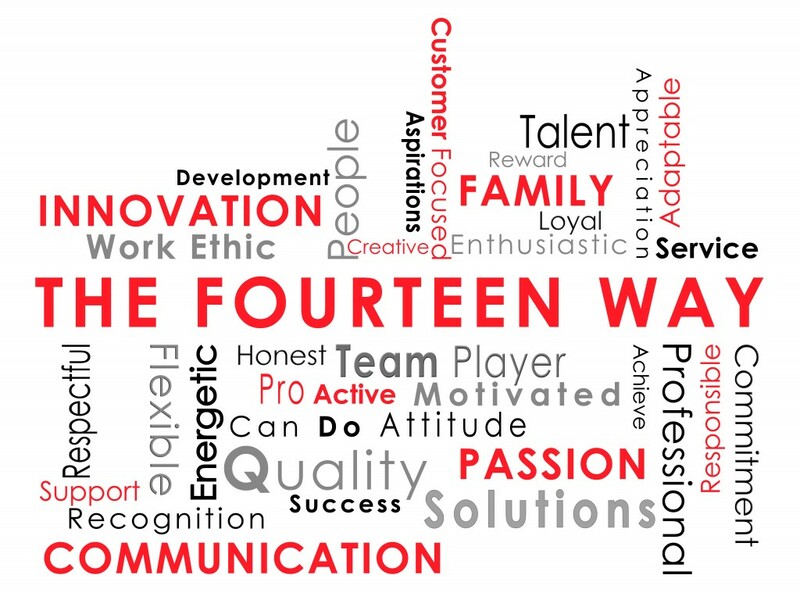 The Fourteen Way is our Vision, Values and Culture as a business. Our Vision is to grow and develop our company to be the Voice and Data Solution Providers of choice in the UK, Europe and beyond. We will reach our goals by providing the very best solutions, employing the very best staff and training them to the highest standards possible. Fourteen IP cares passionately about its customers and its employees and we work very hard to ensure we offer the very best to both at all times. We will make mistakes, we will learn from them and continuously improve and we urge our customers and our employees to provide feedback to us at any time, to help us to improve in any way, no matter how small. Our core values guide the way we work with each other, our customers, our suppliers and any other business partners we work with on a day to day basis. We believe that our ambition will come to actuality through the application of our core values. Values need to be lived and performed, not just written, read and spoken. We treat our people like FAMILY. Our people are our most valuable resource. We show appreciation and respect, working together in a supportive environment towards a shared company purpose. Commitment to INNOVATION. Customers are at the heart of what we do. We endeavour to have the highest quality and sustainable development of innovative solutions to meet the business requirements of our customers, assisting and supporting them to achieve their own aspirations. We go the extra mile! We have PASSION for what we do. By being passionate, energetic and enthusiastic, we can achieve, apply creative thinking to solving challenges and enhance both work and customer satisfaction. COMMUNICATION is key. We communicate through a consistent and clear framework, ensuring all our people are informed and involved and that key messages are re- enforced. The Fourteen Way Values are to be embedded throughout the company via the recruitment process, performance management systems, communication, recognition and management focus. Fourteen IP is The Systems Integrator to the Hospitality Industry providing both Cloud-Based and On-Premises Telephone Systems, Guest Engagement and both fixed and wireless Guest Internet Access solutions. Our Evolution Voice Cloud PBX is live in tens of thousands of hotel rooms across 13 countries, making it the leading cloud PBX for hotels.